Cincinnati Bengals | NFL News, as it happens, when it happens. Your one stop shop. After watching the first round of the 2015 Season Play-Offs, one thing resonates loud and clear…bitter rivals will do anything they can get away with to win! So, why are we hearing absolutely nothing from the Commissioner of the NFL, Roger Goodell? After the blatant issues that occurred in Cincinnati Saturday you would expect some sort of investigation announcement first thing Monday morning…but the silence is deafening. 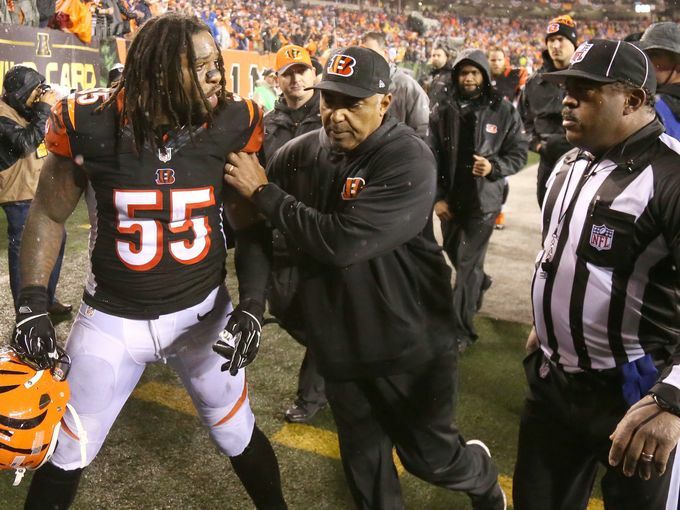 The only thing the NFL has announced is Bengals linebacker Vontaze Burfict has been suspended without pay for the first three games of the 2016 regular season. Meanwhile, there has been no mention of a coach pulling a players hair and another going on the field for no reason other than to incite players. This was a case where everyone at the game left with a smell that wasn’t very pleasant…including the fans. In the world of professional sports the buck stops at the top. In an NFL game that is the Head Coach, who is responsible for the actions of his underlings AND the NFL Commissioner, who is responsible for being certain the officials enforce the rules equitably in all games. In Saturday’s game they all fell down on the job. their roster who will not control their emotions and have no realization of how their actions affect the game. 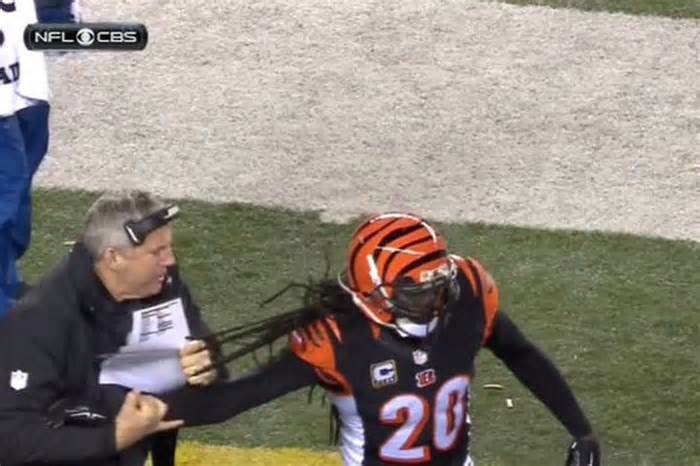 On top of that, the Bengals Head Coach, Marvin Lewis won’t take control of the situation. According to NFL Media Columnist Michael Silver several players inside the Bengals‘ locker room — none of whom wanted his name used, for obvious reasons — felt that Lewis deserved the criticism, citing a season-long lack of discipline among some defensive players in games, practices and meetings. So, why would a member of his coaching staff refrain from going on the field of a highly volatile game and inflame things to a higher degree? 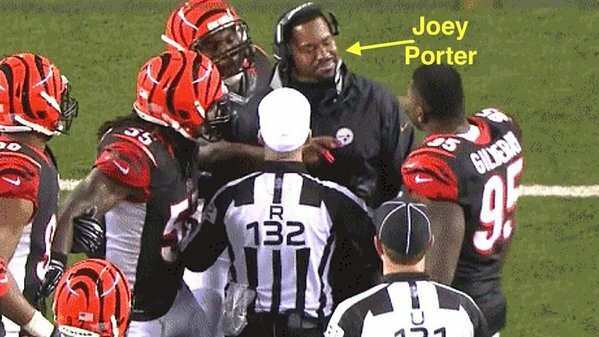 Joey Porter did just that…and got away with it. 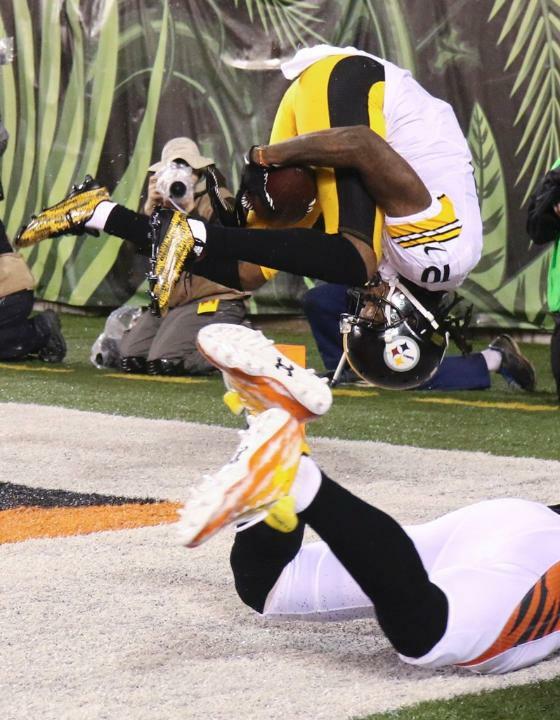 He may ultimately be fined, but his actions resulted in a 15 yard penalty against Adam Jones (deserved) and nothing against the Steelers. 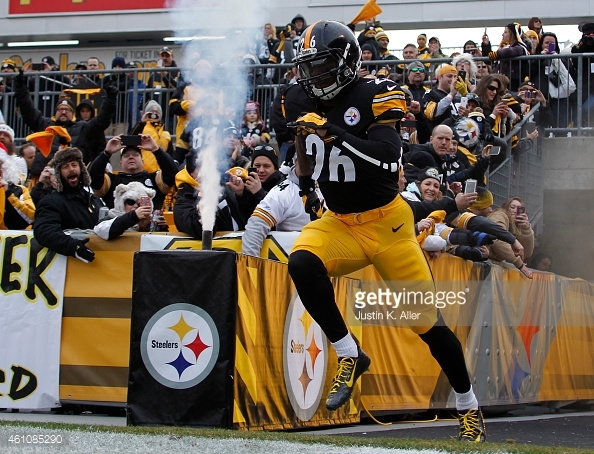 The result, a chip-shot field goal giving the Steelers an improbably win. If the officials had enforced the rule properly there would have been a 15 yard penalty against Porter and a 15 yarder against Jones, offsetting each other and resulting in a 50 yard Field Goal attempt. Article I, section 8: Non-player personnel of a club (e.g., management personnel, coaches, trainers, equipment men) are prohibited from making unnecessary physical contact with or directing abusive, threatening, or insulting language or gestures at opponents, game officials, or representatives of the League. The penalty: 15 yards. 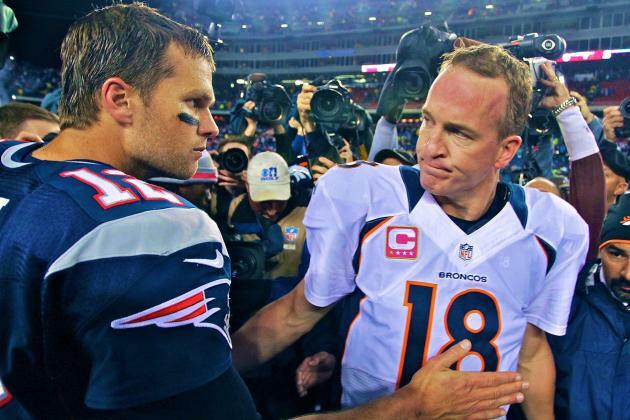 The game came as advertised, with the bitter rivalry continuing to effect the emotions on both sides. The officials tried to keep the game under control, but it was an impossible task. You have to wonder if Commissioner Goodell had talked to both owners prior to the game with a warning of strong consequences for misbehavior, whether things could have kept under control. You would think that the town you play football in has your back. Especially if your the starting quarterback. 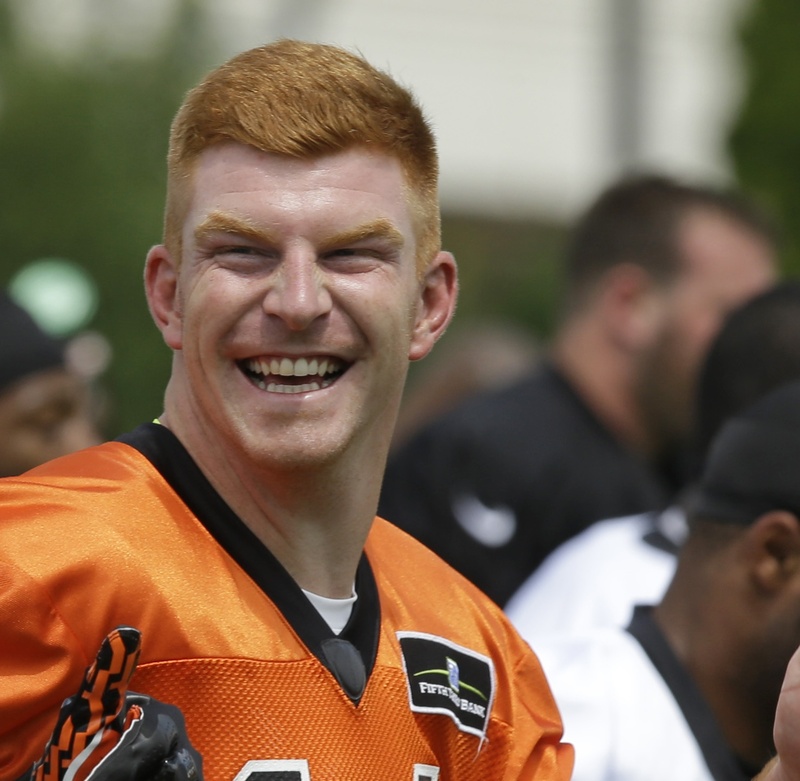 Cincinnati Bengal’s quarterback, Andy Dalton, was booed while making an appearance at Great American Ball Park in the Queen City. So, I guess, success isn’t no longer measure by a playoff berth, in Cincinnati. 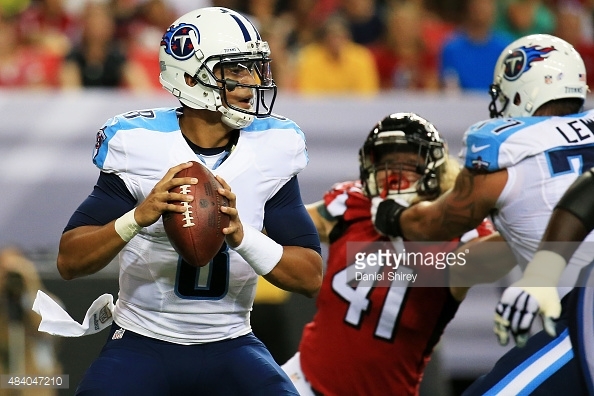 Dalton’s track record is impressive, if you don’t look past December. With a woeful 0-4 record and early exits in the post season. Maybe he doesn’t have to worry. 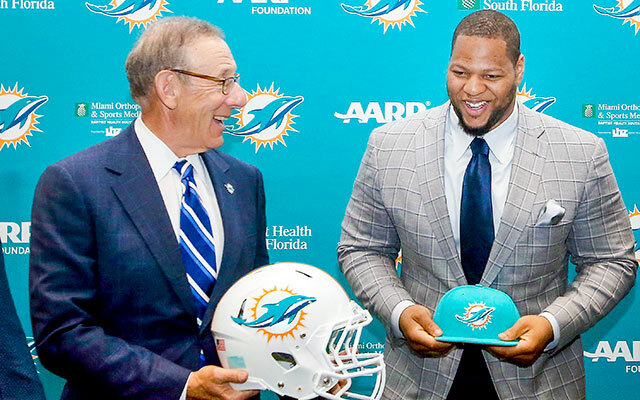 Having signed a six-year $115 million contract, entering into the second season of the contracts duration. Could this be a make it or break it year for the red rifle? Dalton hit two home runs in the ball game. If you were wondering.